BobHope is a Legacy Library. Legacy libraries are the personal libraries of famous readers, entered by LibraryThing members from the Legacy Libraries group. » Bob Hope's legacy profile. BobHope is also an author. 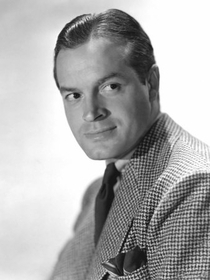 » See Bob Hope's author page. About meThe fifth of seven sons, he was born Leslie Townes Hope in Eltham, England on May 29, 1903. In 1907, Leslie's father brought the family to Cleveland, Ohio. In 1920, by virtue of his father's naturalization, he became a U.S. citizen. Bob Hope started out his career as a vaudevillian, then hit Broadway. Bob's personal life changed during the Broadway play "Roberta." One of his co-performers in the musical, George Murphy, introduced him to a young singer, Dolores Reade, then appearing at the Vogue Club on 57th Street. After a brief courtship, the couple married in February 1934. They have four children: Linda, Anthony, Nora, and Kelly; and 4 grandchildren. In 1938, Bob was signed by Pepsodent for his own show on NBC. He became a Tuesday night habit and his show was soon rated number one with American listeners. Bob did his last regular radio show in April 1956. In 1938, Hollywood took notice of Bob and he was hired by Paramount. The "Road Pictures" with Bing Crosby and Dorothy Lamour made Hope a box office star. In all, Hope starred in more than 50 feature films and has appeared in cameos for another 15 -- the last being "Spies Like Us" in 1985. The Academy of Motion Pictures Arts and Sciences has honored him five times --- two honorary Oscars, two special awards and the Jean Hersholt Humanitarian Award. Bob has also introduced two Academy Award-winning songs: "Thanks for the Memory" with Shirley Ross in "The Big Broadcast of 1938" and "Buttons and Bows" in "The Paleface" (1948). Bob made his formal debut on NBC television Easter Sunday, 1950. Frigidaire sponsored the special, "Star Spangled Revue". The formula, along with Bob's unshakable decision to avoid a weekly show, proved extremely successful. For 60 years (radio and television) Bob was an NBC headliner and Nielsen ratings king. Bob Hope is also known for his love of golf. Probably his greatest achievement in golf is the development and hosting of the Bob Hope/Chrysler Classic, a pro-am tournament held annually in Palm Springs, California. Bob Hope has been feted by his native England. In 1998, by order of Her Majesty Queen Elizabeth II, Bob received an honorary knighthood - Knight Commander of the Most Excellent Order of the British Empire (KBE) in recognition of his contribution to film, to song and to the entertainment of troops in the past. Cited by the Guinness Book of Records as most honored entertainer in the world, Hope has more than two thousand awards and citations for humanitarian and professional efforts, including 54 honorary doctorates. For nearly six decades, be the country at war or at peace, Bob, with a band of Hollywood gypsies, has traveled the globe to entertain our service men and women. Five times Bob has been honored by the United States Congress. In October 1997, Bob received one of his greatest tributes when Resolution 75 was unanimously passed by members of both houses making him an Honorary Veteran - the first individual so honored in the history of the United States. Bob Hope passed away July 23, 2003 at age 100 in Taluca Lake, Los Angeles, California from pneumonia. He is buried in San Fernando Mission Cemetery. About my librarySource of books: Julien's October 2008 Property from the Estate of the Legendary Bob Hope auction.